If you are a dog lover, few things are funnier that watching videos of sweet puppies barking at themselves in the mirror. OK, maybe dogs playing with babies, dogs playing in a pile of leaves, dogs taking steps into their first snow – but you get the point. But what do dogs really see when they look at their reflection? Human beings are not born with the ability to recognize themselves in the mirror. Up until the age of 18-24 months, babies may be fascinated by their reflection, but they do not understand that they are looking at themselves. I must note that even at 156 months plus, some young humans still find their image most fascinating and desire to share it with the world. Thank goodness that dogs can’t operate cameras! Regarding animals, scientists have developed ways to measure their self awareness. The mirror self-recognition test (MSR), also called the mark test, has been considered the “gold standard” in this regard. It was originally developed by American psychologist Gordon Gallup Jr. in 1970. It involves painting a spot or attaching a sticker to an animal and observing their attempts to investigate the mark while looking into a mirror. Results lead to an assessment as to whether the subject considers the image in the mirror to be another being or a reflection of itself. Humans grade out on all five levels of self awareness before they reach 4-5 years old. Those levels beyond the base Level 0 of Confusion are Level 1 – Differentiation, Level 2 – Situation Level, 3 – Identification Level 4 – Permanence Level, and Level 5 – Self-consciousness. Few species have passed the MSR test. Outside of the great apes (orangutans, chimpanzees, orangutans, gorillas, bonobos and of course humans) there is little documented evidence. But conclusions from the mirror test are not incontrovertible and other studies have indicated levels of self awareness in elephants, dolphins, orcas, magpies, and pigeons. So what about our beloved canines? So far they are among a long list of species to have failed the MSR test. 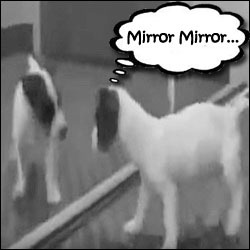 Most studies have shown that when dogs see their image in the mirror, they will either treat it as another animal or ignore it completely. Many researchers thus conclude that dogs lack any advanced level of self-awareness. Others have proposed that dogs do recognize their reflection, but are not as vain with their appearance as higher primates. However, Marc Bekoff, a biologist from the University of Colorado, sees another interpretation. He asserts that the reasons dogs not not react n the same ways humans do to a mirrored image is that the most important sense for dogs is smell – as opposed to sight for primates. To test his hypothesis, he used a “yellow snow test” instead of the traditional “red dot test” and then tracked where his dog would recognize the scent of his own urine versus the markings of another dog. Now personally I am not sure if my dogs possess body-ness, mine-ness, I-ness, or any other kind of “ness” – well maybe loads of cute-ness. RJ definitely thinks there is another dog there and he paws and stares at our full length mirror. Yoshi does this as well. I don’t think they think they realize they are looking at themselves, just another dog. The canines in our household have no reaction. However television does seem to draw their interest regularly. The networks and Nielson at least should be happy, even though they are not very discerning viewers. But that is a conversation for another day. Now on to some funny videos of dogs watching themselves. Gosh I love dogs!